Next Tuesday, April 15th, will be Jackie Robinson Day. It'll be the 61st anniversary of the day Robinson broke Major League Baseball's color barrier. Last year, for the 60th anniversary, Robinson's No. 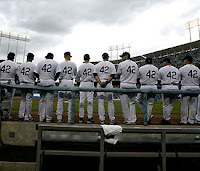 42, which had been retired throughout MLB, was put back into circulation for that one day, and dozens of players wore it to honor Robinson and his legacy. Well, now MLB is putting the number back into circulation again. Players will once again have the opportunity to wear No. 42 on Jackie Robinson Day. I have one question: Why? Seeing it being worn last year was a beautiful thing. (It would have been even more beautiful if more white players had worn it.) However, doing it again this year only waters down the whole idea. I can understand wearing it on a milestone anniversary like the 60th. But, doing it again a year later borders on travesty as far as I'm concerned. Wait until the 70th anniversary to wear No. 42 again. Do it every 10 years, not every year.